WHAT ARE "STICKING PIANO KEYS" ? If the client has correctly diagnosed the problem, 'unsticking' a couple of piano keys on an upright piano is free of charge, and included into the cost of the tuning visit. It takes just a few minutes to unstick a piano key, so I don't charge any extra. On some occasions however, the term "sticking key(s)" is often used as a default phrase for anything inside the piano that is not working properly - even if it is not a sticking key. This short tutorial will hopefully be helpful to anyone needing to know the correct symptoms of a sticking key. To find out if the key itself is sticking, simply play the offending note firmly, and hold down the key for a few seconds. Try and remember the key played. Now let go of the note and the sound will stop. sticking key - so the problem lies elsewhere inside the piano. After playing the note firmly, when the key is released, if it stays down in the 'played' position for a while, or the key(s) return slowly, (or not at all) - then this is a sticking key. A sticking key is the fault of the piano key only, and not usually connected to any other part of the mechanism. Unsticking the keys is a simple adjustment and only takes a couple of minutes or so on an upright piano. Should a piano be subject to damp/cold conditions, this may swell or corrode the lead weights inside the keys - if they are rubbing against an adjacent key, this will cause the key to stick down. This is an easy fix aswell. 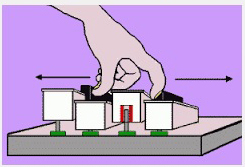 What causes a piano key to stick? Piano keys are made of soft American Bass wood - similar to MDF; this wood is very light. At various pivot points, red cloth bushings are inserted to ensure that the key works correctly and smoothly, and when it pops back up, it maintains the same level as the other keys. If the room is (or was) cold and damp, this will swell the wood inside the cloth sockets, and so the key pins (under the keyboard) may excessively rub up against the cloth, causing the key to stick. A single piano key has various adjustment areas where the pins may rub. The diagram (left) shows the red bushings at either side of the key socket. At this point, the key should be able to be wiggled side to side a fraction, so the felt does not actually touch the pin, but more or less "brush" against it very gently. If the key does not wobble side to side at all (and sticks down) - the key must be removed, and the wooden sides of the piano key eased in gently. 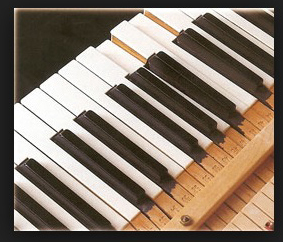 NOTE: If your piano keys wobble side-to-side excessively, this can be more serious - so contact me for more details. This image demonstrates the art of "key easing" to a black key (sharp) by carefully easing the wood back using parallel-jawed key easing pliers. Extreme care must be taken not to over-ease the wood, and this may cause the key to collapse, or have the reverse effect of sticking even more. Should only be carried out by an experienced piano tuner/ technician. A set of new key bushings often require easing around three times per key. This is just the tip of the ice berg for key easing - and it suitable for this tutorial. 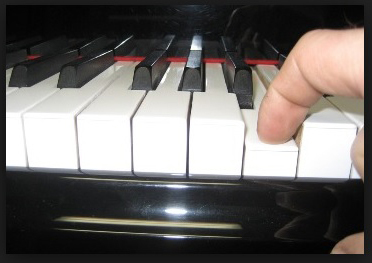 Grand piano keys that stick in the same way as upright pianos are no different in their symptoms. However due to the design of the keyboard linked and secured to the mechanism with about ten screws, the removal of a single key requires the whole mechanism to be unscrewed and removed prior to removal of any piano key, so there would be an additional fee for this service. The 'key easing' process may be at the front of the key (like image 3 above), and the mechanism does not need to be removed, but various cabinet parts. If you own an Erard grand piano, key easing for these pianos is specialised - so contact me for more information. # Rear of key (dog leg) separated or broken from main body of the key (common on some Hopkinson upright pianos). # Hammer head/ shank broken off - reducing the weight of the mechanism, so key does not return fully. For these reasons (and others), the only way to diagnose the problem successfully is to inspect the piano face to face, then a price would be quoted during the visit for any additional repairs or adjustments.